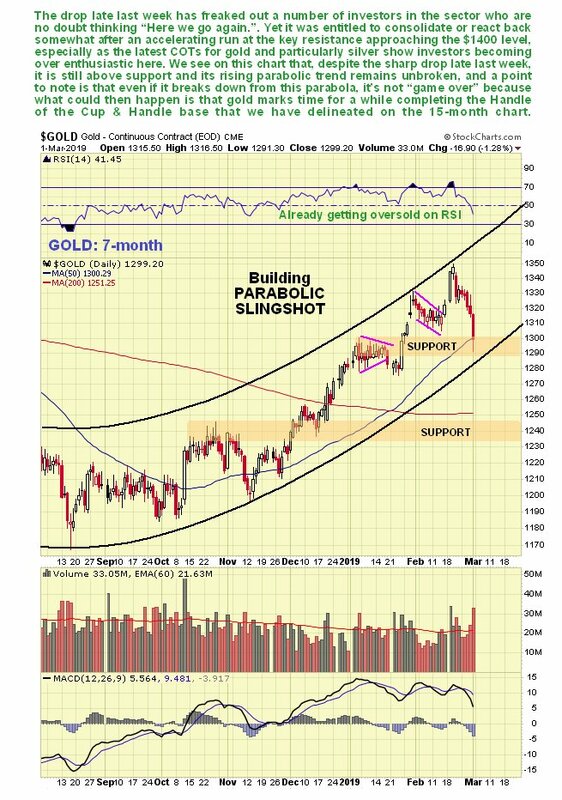 Technical analyst Clive Maund discusses gold's recent price decline and how that could be setting it up for a sustainable breakout. The rather sharp drop in gold late last week, especially on Friday, came as something as a shock to many investors in the sector, yet as we will proceed to see it was set up to react back here or soon, and a period of consolidation or reaction at around this level will actually put it in a better technical condition to mount a sustainable breakout above the key $1400 level. On its latest 7-month chart the first point to observe is that gold is still well within our parabolic uptrend, whose lower boundary is coming into play and providing support, as is the rising 50-day moving average, with additional support being generated by premature sellers in the small Pennant pattern that formed during the first half of January. This is why it closed well off the lows on Friday, and why it could now resume the upward path again soon, and here's the point—even if it doesn't and instead breaks down from the parabolic uptrend, which the sizable drop on strong volume on Friday certainly makes possible, it will not be the "end of the world" for gold, and we will see why that is on our next chart. On the 15-month chart we can see why a period or consolidation/reaction here is actually good for gold, and will put it in better shape to break above the resistance approaching and at the $1400 level. This is because the accelerating run-up in gold since November resulted in it closing on this strong resistance in an overbought state, and it would be better if this unwound before it makes a determined attempt to "cross the great water." Thus it is very interesting to observe that the pattern that has formed in gold since last summer is a rather fine Cup, and as any tearoom devotee would say "What is a Cup without a Handle?," and when a Cup like this forms on the charts, it is very often followed by a complementary Handle that sets it up to break above the resistance at the upper boundary of the entire pattern into a major bull market. 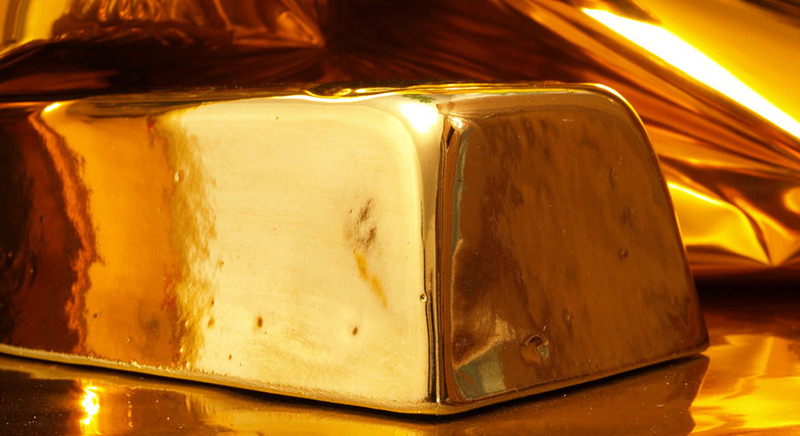 A prospective Handle area is shown that will doubtless require to be adjusted later, but serves to give us a rough idea regarding how long gold will need to consolidate before breakout can occur—by the look of it four to six weeks. 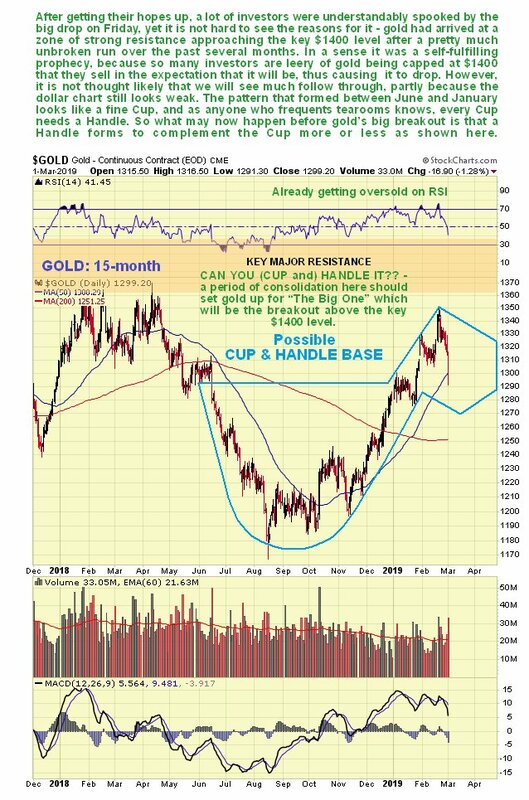 Lastly, we need to see how this prospective Cup & Handle base pattern fits into the larger base pattern that is approaching completion in gold. 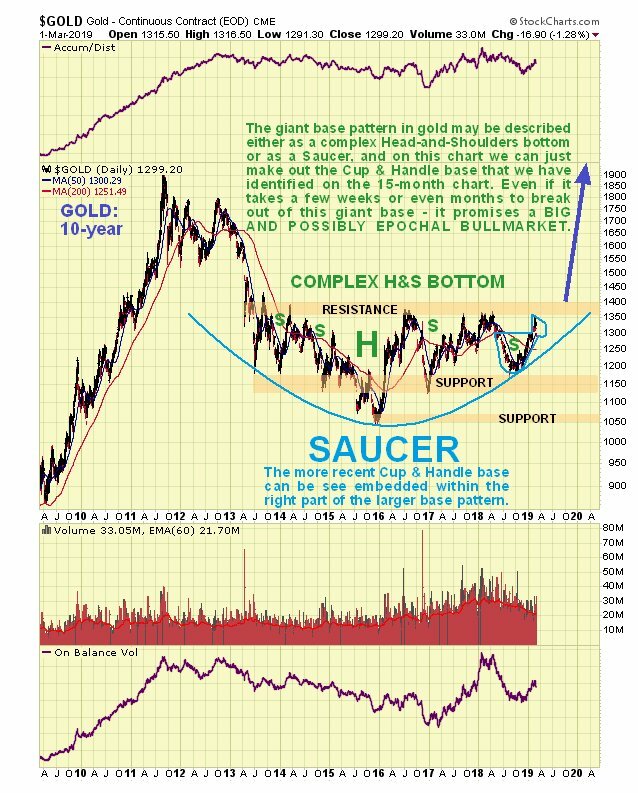 On the 10-year chart we can see that the Cup & Handle delineated on the 15-month chart is dwarfed by the much larger base pattern that can either be defined as a complex Head-and-Shoulders bottom or as a giant Saucer base. With the Saucer boundary now rising and closing steadily on the major resistance at the top of the pattern, it is clear that breakout must occur by about the end of the year at the very latest, and it is likely to occur much sooner than that. 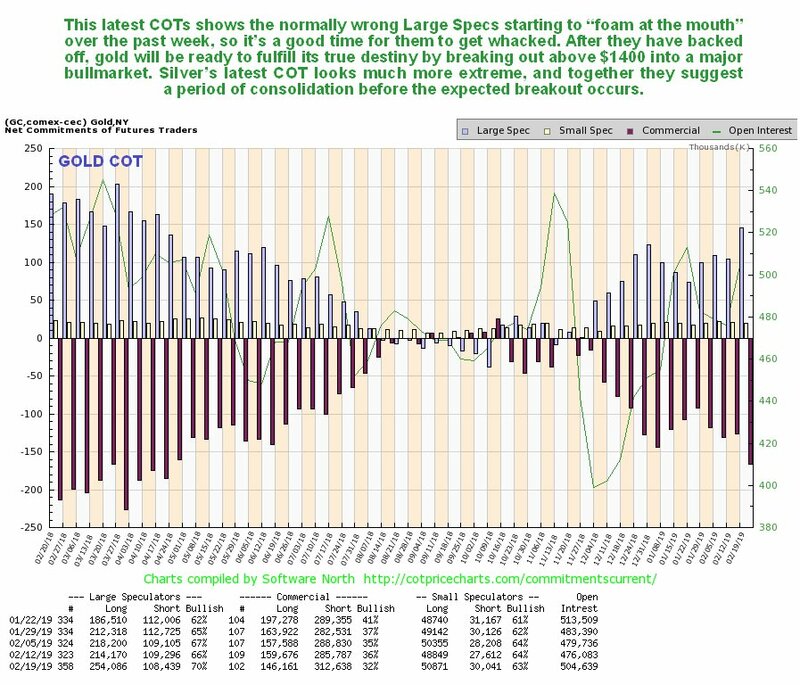 The latest gold COTs provided a valuable clue as to the increased likelihood of a near-term retreat, or rather they would if they were released in a timely manner, instead of three days late. They show that the Large Specs started to get very confident over the past week or two, and as they are normally wrong, that preceded the drop of the past three days. The more these positions moderate in coming weeks, the better will be the chances of gold mounting a sustainable breakout above $1400. 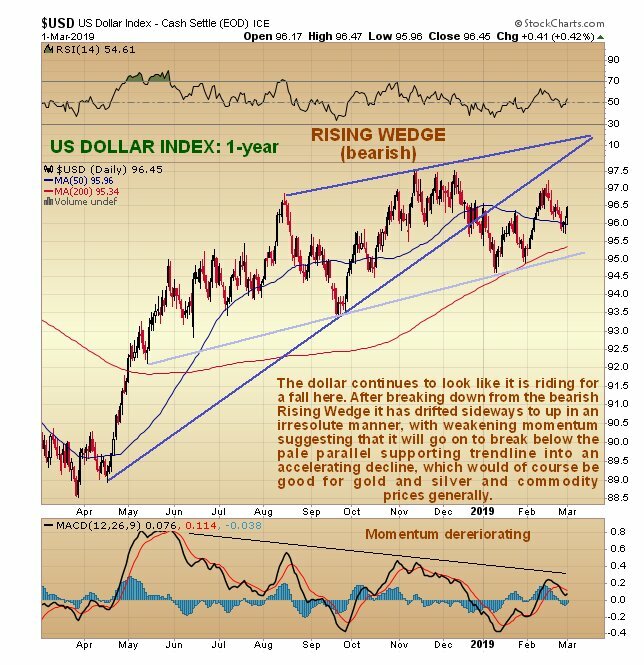 Finally, on its 1-year chart, the dollar index still looks like it is riding for a fall. Following its breakdown from a bearish Falling Wedge, it has staged a rather hesitant faltering rally which is not confirmed by momentum, which is relatively weak. This suggests that it will go on to break below the pale parallel supporting trendline shown, which would be expected to lead to an accelerating decline that would likely be the catalyst for gold breaking above $1400 into a new bull market. CliveMaund.com Disclosure: The above represents the opinion and analysis of Mr Maund, based on data available to him, at the time of writing. Mr. Maund's opinions are his own, and are not a recommendation or an offer to buy or sell securities. Mr. Maund is an independent analyst who receives no compensation of any kind from any groups, individuals or corporations mentioned in his reports. As trading and investing in any financial markets may involve serious risk of loss, Mr. Maund recommends that you consult with a qualified investment advisor, one licensed by appropriate regulatory agencies in your legal jurisdiction and do your own due diligence and research when making any kind of a transaction with financial ramifications. Although a qualified and experienced stock market analyst, Clive Maund is not a Registered Securities Advisor. Therefore Mr. Maund's opinions on the market and stocks can only be construed as a solicitation to buy and sell securities when they are subject to the prior approval and endorsement of a Registered Securities Advisor operating in accordance with the appropriate regulations in your area of jurisdiction.